The WordPress Dashboard is a great place to see updates, or any kind of information related to your activity. In this tutorial, we'll see how to dispose of default widgets and how to create your own custom widgets. We are going to create a simple plugin to handle this so it can apply to any theme. 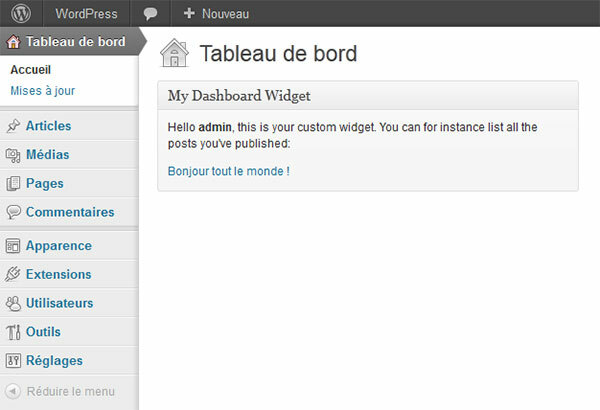 Create a new folder in the plugins directory (wp-content/plugins) and put a file named dashboard_widgets.php there. Save it and it will already be available for activation in the plugins page. We are now going to create the class that will hold our functions. Notice the way we bind the functions array( $this, 'remove_dashboard_widgets' ). Because it is a class, you have to tell WordPress the function belongs this class. Let's create another file named custom_widgets.php. It will contain our widgets definitions (both to remove default and add new ones). First, let's add some widgets to be removed. It is basically an array which contains IDs of widgets to remove and information on where to delete them (page and context). So let's define our widget and set those parameters. For this tutorial, we'll create a very simple dashboard widget that will display the current users' last published posts. As the callback option required a valid function to handle the widget's content, let's add a function for this. Now we've defined the widgets we want to remove from the dashboard as well as the ones we want to create, we can focus back to our class. Now, all that's left to do is to actually add and remove those widgets. So get back to our class and let's fill in the blanks left in Step 1. To remove our widgets, we just loop through our $remove_defaults_widgets array and apply the remove_meta_box function with the parameters we set for each widget. Be sure to "globalize" the $remove_defaults_widgets variable, otherwise you won't be able to use it. Exact same process here, except we apply the wp_add_dashboard_widget function. Now, you can add whatever widget you want to your WordPress' dashboard, simply by adding options and callbacks to the custom_widgets.php file. It's always a good idea to customize the dashboard, especially when it is for a client. You can list their last articles, comments, reminders, etc. So it becomes a convenient place to start from. Let us know what you think in the comments below, especially if you have more suggestions on customising the WordPress Dashboard for clients.